Our twins boy girl diaper cake, designed with both pastel pink and blue accents is perfect for the lucky parents of the new baby girl and boy. The classic pink and blue color scheme is also a great alternative to neutral colors when the shower is for a baby whose gender is not yet known. This is quite an impressive diaper cake. 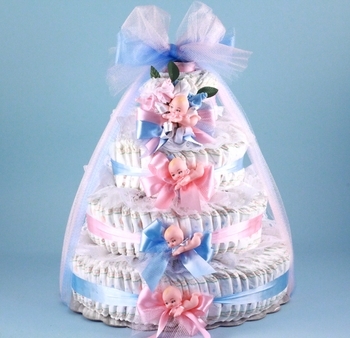 Made from 152 newborn diapers, its 4 tier design makes it a stunning shower gift or centerpiece. It also features a corsage that the new Mom can wear at the party and it is made from two pairs of infant socks…cute! We then finish it with little Kewpie dolls, pink and blue ribbon accents and wrap it all in multi-colored netting material to complete this unique creation.